Starring Vegar Hoel, Stig Frode Henricksen, Charlotte Frogner, Jenny Skavalan, Lasseter Vadal, Evy Kasseth Røsten, Jeppe Beck Laursen. 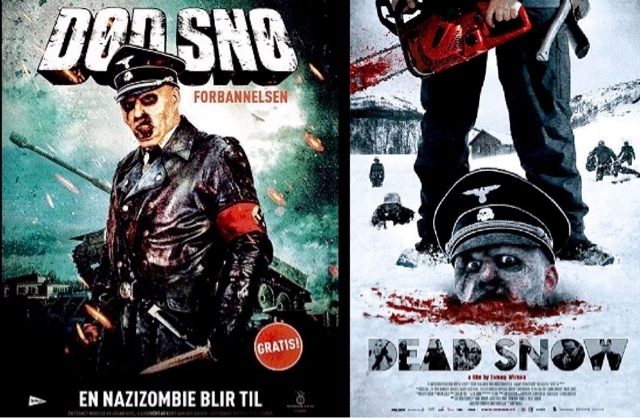 Dod Sno or Dead Snow as it is called outside of Norway, where this great movie was made is a great movie, with in my opinion a great nod to the early horror films of Peter Jackson, with excessive violence, bloodshed but also with great wit and charm, with even one character wearing a Braindead T-shirt, which is Peter Jackson's finest work. 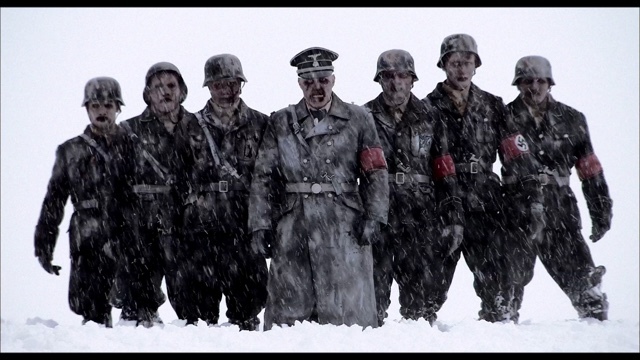 Dead Snow is so good though I forgot I was actually watching a foreign movie, the script, dialogue is amazing, with surprisingly no unlikable characters, with superb special effects, and like Peter Jackson's Weta all the effects were created by the film makers, creating their own special effect studio, which is why this movie needs to be admired. Seven medical students take an Easter break at an isolated cabin, for a weekend of snowball fights, snow fun, and alcohol induced partying, unbeknownst to them ignore the local folklore of cursed mountains, and a patrol of German Officers who went missing in the Great War, who have somehow became the undead intent on protecting their gold, stolen in the War, that resides in the cabin they are staying in. This film is pure tongue in cheek, with its over the top gore, and kills, but surprisingly before all the mayhem starts, has some moments of genuine tension, that even I was uneasy about. It never relied on jump scares which I found to be interesting, with just the use of sounds, shadows, and just brief glimpses of Nazi Soldiers before the midway point where it does become open house on the gore front, then becoming a complete guilty pleasure, which works. Although the movie would have equally worked either way, with it being a comedy or a serious movie, it is that good. With for once a great deal of special features on the disk, with a detailed making of, with so many problems with production, the weather, and actually running out of money, with the crew and actors actually working for nothing to get this great movie made, is such an achievement for an independent crew of talented film makers, that all the perseverance actually paid off to make a really great movie, that is equally scary, and a bloodthirsty guilty pleasure with humour, making this one of my favourite Zombie Movies. With such a great nod to the great man himself, before he went serious on us Peter Jackson, who was a great independent filmmaker and created some great early pieces of horror. If you loved Braindead, and Bad Taste, you will love this movie.